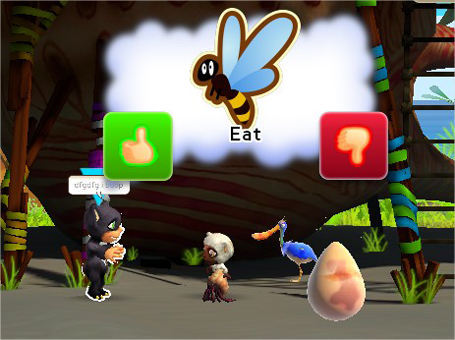 Sorry about the late update, it was meant to be posted Friday but we were a bit busy… anyway, let’s have an overview of Creatures Online’s ecosystem today! - Even though the players can’t interact with every insect, Norns can. Sometimes they hit or eat some insects, which you can reward or punish. 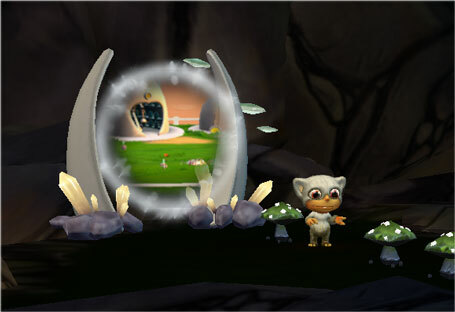 - Flowers, mushrooms & grass patches grow naturally and are randomly placed. That’s it! Have a nice day. Weekly Update #64 – Why is debugging mandatory? This week I’ll simply do a summary regarding the game’s shop. (1) Spotlight: More and more objects are available in shop according to your current level. This category shows the latest items unlocked. (2) Resources: In this tab you’ll find coins and golden eggs. 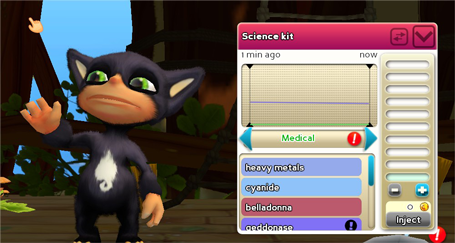 (3) Genetics: You can buy here genes pack to use with the Splicing Machine. (4) Toys: Self-explanatory. Toys mainly relieves Norns’ boredom. (5) Decoration: A lot of items are present here, which are purely for decoration. Though actually there may be some exceptions. (6) Ecosystem: You can buy here plant pots (to grow fruit plants) and critters. Naturally occurring flowers, grass patches and insects can’t be bought as they depend of the world. (7) Others: You can buy here coin machines and nests for your Norns to sleep. (8) Hide / shows a small description of the concerned item. 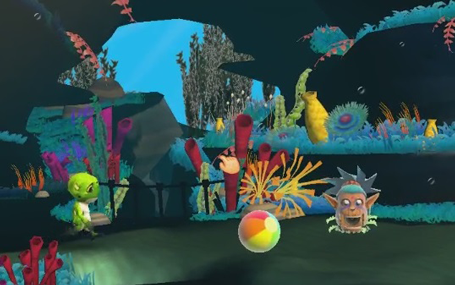 (9) Upon buying an object, the game let you place it. However, you can stock objects you don’t want to place immediately. That’s why you can see a “Use” button here: I already have one of these objects in stock. Each Norn has 8 cosmetic genes, each one impacting the appearance of the Norn. Changing the 1st one will have an impact on the belly, the 2nd one on the pattern the Norn has and so on. There are 4 body types, each gene corresponds to one of them. The body of the Norn is an “average” created from these genes. See for example how the body shape changed when I replaced Bananou’s genes with Feral genes. Two Norns with the same genes will look the same in the Splicing Machine as the preview shows you how the Norn should look with these genes. That’s why Bananou and Brugno seem similar. However, once spliced they can have small differences even with the same genes. 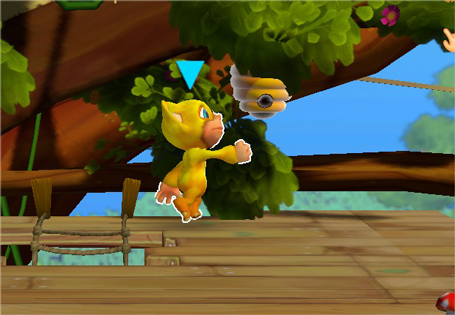 If you look carefully, in-game Bananou has 2 white spots on the hips, while Brugno has a white mark on the right arm. The pattern on Norn fur is defined by genes #2 and #3, but the color for these patterns are defined by genes #5 and #6. Time required for splicing depends on the number of genes modified (and the type of these genes). From the “My Eggs” section, you can see your eggs and hatch them if you want to (1). You can also see the 8 appearance genes of this egg by clicking on (2), allowing you to have an idea of how the Norn may look without hatching it. If your game is linked to a Facebook account, you can also send this egg to a friend (3). 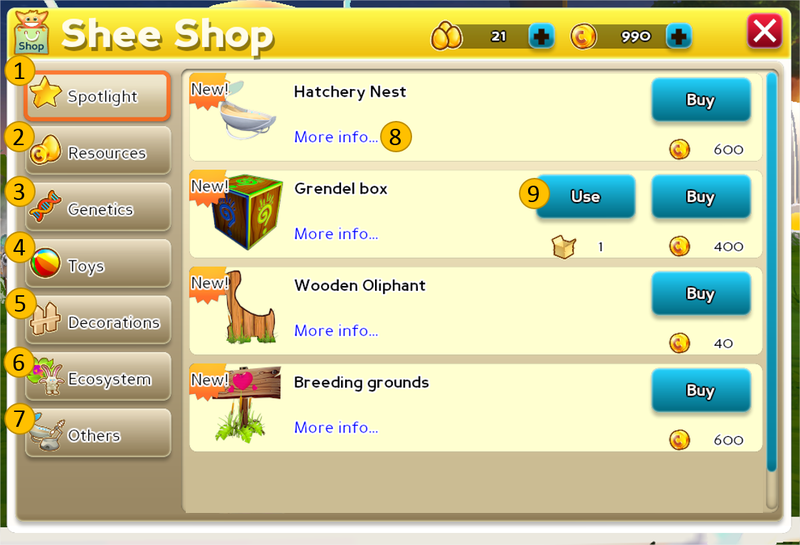 You have a limited number of egg slots, but you can buy some more using coins or Golden eggs (4). 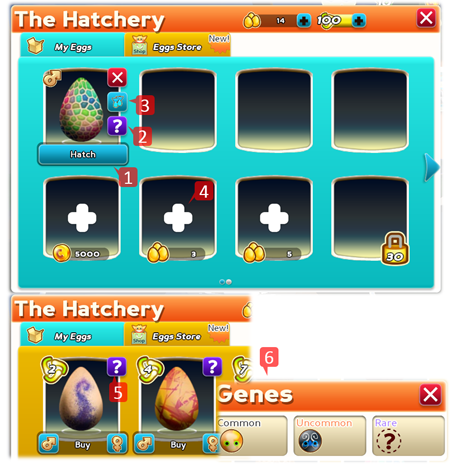 Click on (5) on the “Eggs Store” section to see which appearance genes each egg can contain (6). Eggs can be bought with energy, which refills automatically with time. …and that’s all. Sorry to have only some debugging information to share with you once again, but debugging is mandatory (unless you would like to have this kind of Norns). 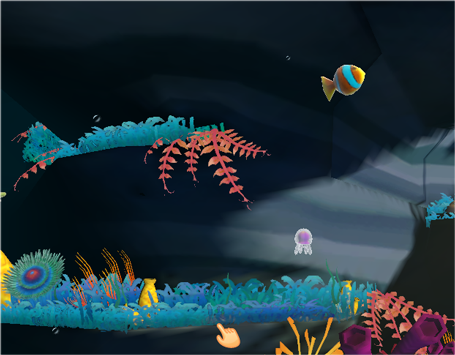 Most plants can’t be grown underwater, but some of them can. 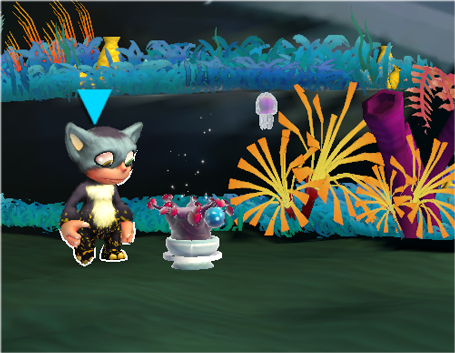 This week, we added possibility to switch worlds by tapping on the teleporters. Before that, the only way to change the current world was by using the world monitor (the interface allowing you to see your worlds and in which world each of your Norn is). We also tweaked the volume of some sound effects. Some were quite piercing. - There are different Norns voices, one of them being much like the old classic Norns voices. Simply, none of the Norns in the video had it. It depends of the Norn. - If you don’t collect coins / XP by yourself, they will be automatically collected after some seconds, you actually don’t need to collect them one by one. That’s all! I wish you a nice week. We also updated some icons and descriptions for the item kit products. 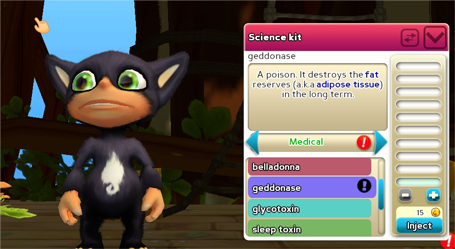 Science kit descriptions have now colored chemical names allowing a better basic understanding. We also changed the order informations were displayed on the level up screen, as it was somewhat counter-intuitive. 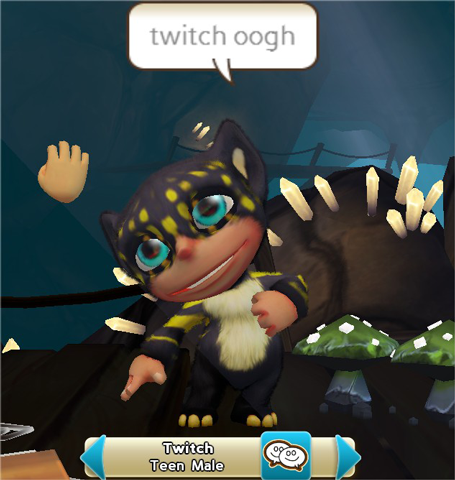 Concerning the Twitch session… We still have no information regarding the exact date. Of course, we’ll keep you updated! That’s all. Have a nice week!